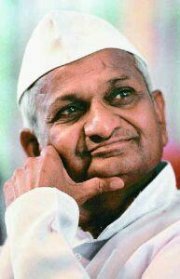 This person, Anna Hazare was awarded Padma Bhushan and is a known figure for his social activities. 7. It's an entirely new thing right..? Baba Ramdev, retired IPS Kiran Bedi, RTI activist Arvind Kejriwal and many more. Filmstars like Aamir Khan r also supporting his cause.